The world of dance is an intriguing mystery to any outsider. We appreciate the beauty, but will rarely understand the sacrifice. The life and legacy of Tanaquil Le Clerqc is one well known within the dance community, and now, thanks to director Nancy Buirski, it is a story that all the world can know as well. “Tanny’s” story is an influential one, not only because of what she brought to the world of dance, but how she was forced to leave it at the height of her career. At the age of 27, Tanny contracted polio, a disease that would eventually leave her paralyzed from the waist down for the rest of her life. Despite efforts to get her to walk again, Tanny and those around her faced the difficult truth that her life as a dancer was over. It’s in chronicling her rebirth as an independent woman, away from the world of dance and the role of “muse” to choreographers George Ballanchine (also her husband) and Jerome Robbins, that this film really shines. Afternoon of a Faun is a miracle of a film in that without the testimony of many of the key characters, Buirski relies mainly on archival footage, audio recordings, photographs, letters, and interviews with people close to Le Clerqc and her husband/choreographer George Ballanchine. Buirski has an eye for photography, and though her choices may have been limited with regards to the footage available (Le Clerqc’s career lasted from about 1941-1956, when ballet and most everything else was not widely videotaped), each piece is mesmerizing to behold. A lot of that beauty can be credited to Le Clerqc herself, who moves along the dance floor so elegantly, any novice observer can recognize her talent. The photographs, too, are tonally pitch perfect for the telling of this intimate story. The camera loved her, just like everyone else. It’s very difficult to construct a documentary that makes you emotional towards it’s subjects without hearing from them directly. Luckily, Tanny’s voice comes through strong in what she left behind, as does the larger than life persona that accompanies any genius like George Ballanchine. The two of them together, along with her work with Jerome Robbins, speaks volumes about how passionately they lived their lives as dancers. But it’s the fierce resolve through which Tanny, alone, creates a new life for herself that will resonate the most with audiences. 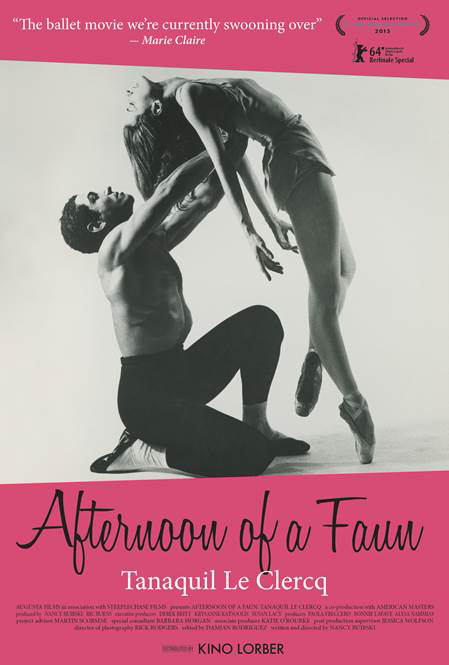 Afternoon of a Faun opens today at the Ritz 5 (Q&As with Nancy Buirski to take place after the 4:30pm and 7:00pm opening day screenings on March 7th). For more insight on the film, read our interview with director Nancy Buirski.